Seven salmonid species will return to Elwha River headwaters now that the dams are out. The time has arrived to restore healthy population of wild salmon to the Columbia River watershed. Four articles published in newspapers around the region in recent days discuss essential ingredients for salmon restoration throughout the Columbia River watershed (including in Canada): water and passage. Tom Stuart, chair of the Save Our Wild Salmon coalition, explains why water spills at dams are needed in order to bring wild salmon back to Idaho in meaningful numbers. Failure to breach the 4 lower Snake dams has created a crisis, and more flow over the dams is essential to push the juvenile salmon downstream. See “Idaho and its chinook deserve an expansion of water spills” (Idaho Statesman, Jan. 27, 2014). Dan Chasan at Crosscut.com analyzes the federal government’s latest salmon recovery opinion for the Columbia River’s gauntlet of dams. The last 4 versions of this plan have been struck down by the courts, and the latest draft doesn’t cut the mustard either. At issue is the competition between putting water through hydropower turbines versus spilling it over the top to speed juvenile salmon on their way to the ocean. Under the federal plan, once again, hydropower wins and salmon lose. “Fed’s latest Columbia River plan: play me an old-fashioned melody,” (Daniel Jack Chasan, Crosscut.com, Jan. 27, 2014). Why have the courts let the feds off the hook for nearly 20 years? From British Columbia, a recent interview with tribal fisheries policy experts Bill Green and Paul Lumley examines how an updated Columbia River Treaty could help get salmon up and over Chief Joseph and Grand Coulee dams into Canada (past the Canadian dams) and on to the headwaters. As Green notes, the smashingly successful return of sockeye to the B.C. Okanagan “is a testament to the power of salmon when you give them an opportunity to do wonderful things.” See “Canadian Columbia River salmon reintroduction emerges as Columbia River Treaty review issue” (Aaron Orlando, Revelstoke Times Review, Dec. 27, 2013). The fish are there, just waiting for the water and an open door to push on through . . . . 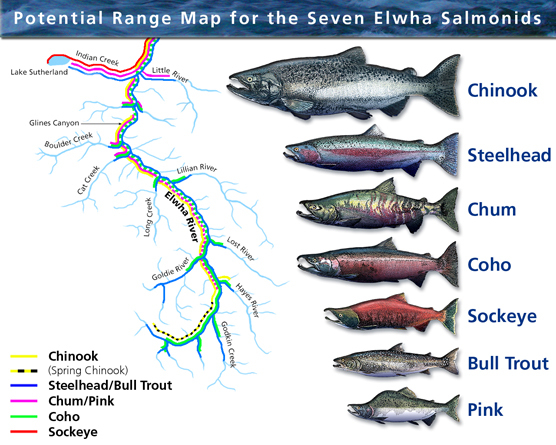 Categories: Columbia River Treaty, Instream Flows, Salmon | Permalink.